Are you curious about goddess braids and thinking about installing them in your natural hair? Goddess braids are a chic-looking hairstyle that can be worn for any occasion, but learning how to do them can be a major project. This braided hairstyle looks fantastic if you do it right. It takes much less time to complete goddess braids than other extension styles. Plus, the extension hair is on the cheaper side and probably won’t break your wallet. In this post, you’ll find out all about goddess braids so you can figure out whether you want to place them in your natural hair. If you want to learn more about goddess braids, read on. Goddess braids with weave extensions are a protective style which uses one or more thick French braids. The braids are similar to cornrows, but they become much bigger because extra hair is used. 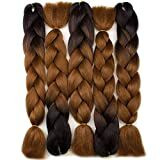 Four goddess braids are popular, and six or fewer braids are usually installed. This cuts down on total styling time. You can do goddess braids with interesting parts that form a straight or curvy design, or you can do simple parts that go all the way back. One of the most important things with goddess braids is to make your parts symmetrical and even because it will affect the result. Thinking about doing goddess braids on your natural hair? The first step is to decide how many braids you want so you can think about how many parts to do and how they will look. To make two braids, you’ll only need one part. To make three, you’ll need two parts. You don’t need to straighten your hair with a flat-iron for goddess braids, but you will want to start with hair that is freshly washed and stretched. Be sure to use a moisturizer and a wide tooth comb to detangle and smoothen the hair. Eco Styler Gel is your best bet for a smooth look, and wrapping the top of the hair with a scarf at the end will help to lay flyaway hairs down. While goddess braids for short hairdo exist, you’ll want to make sure you have enough hair to braid. Any lesser amount may cause the braids to slip out since they won’t have enough to grasp. Three to four inches is ideal. Goddess braids are an accessible style for your little ones too. Kids’ goddess braids are ideal to do the day after wash day, and they’ll keep your child’s hair untangled and tidied for a few weeks. will work the best, and it is the most common. You’ll need anywhere from two to four packs for this style, depending on how thick you want the braids. Begin by parting your stretched, moisturized hair into as many sections as you want. Use Eco Styler Gel to smooth down edges. Get small pieces of the synthetic hair ready so that you can easily retrieve it when needed. Loop the synthetic hair around the root of your natural hair and separate it into three strands. Take from your natural hair and blend it in with more of the synthetic hair as you work your way back like you would with a cornrow. Be sure to braid with your fingers going over the hair, and not under. Secure the ends of each braid with a ponytail holder. Use more of the Eco Styler Gel to smooth your edges, or use a firmer hold edge control paste. Wrap a long silk scarf around the edge to smooth loose hairs for 15-20 minutes. Goddess braids are a fast hairdo that will take you less than two hours to do on your own head. A professional braider or a friend will be able to do it in even less time. How Long do Goddess Braids Last? Goddess Braids will last for up to six weeks, depending on how well you take care of them and how well you installed them. You may want to take them out weekly if you’re going to be able to wash your natural hair thoroughly. Goddess braids are one of the fastest extension styles that you can do at home so you might choose to take them down more frequently than you would if you had to make a salon visit. How much do goddess braids cost? You can always make a trip to the stylist if you don’t want to do them yourself. Expect each goddess braid to cost about $15. Feed-in braids are like goddess cornrows. You have a natural-looking cornrow in the front, but then it gradually turns into a thick goddess braid in the back. Feed-in braids begin with your own natural hair, and then you feed the synthetic hair a little at a time. Add a small amount of synthetic hair every time your natural hair is in your right hand. The feed-in technique differs from the standard goddess braids because it begins from the edges with your own natural hair and continues back. The synthetic hair only appears later, and it is blended well to give a seamless appearance. The feed-in braid result gives a natural look because it shows your hair at the root instead of the synthetic hair. Goddess braids begin by looping the synthetic hair around your natural hair at the root. The result gives a thicker braid from the start. Goddess braids and French braids are basically the same things. The overhanded braiding technique is the same, using three strands and adding in hair as you work to the back of the head. The only slight difference may be the sheer number of braids. Women usually only make one or two French braids. You can always do two goddess braids, but you could choose to do as many as six also. Ghana braids are also known as banana braids, and they aren’t much different from goddess braids. Goddess braid sizes can vary. For instance, you can have small goddess braids or big goddess braids, but Ghana braids are always large. Goddess braids are easy to maintain because you don’t need to do much. Moisturize the hair with a braid spray or a light oil to keep them shiny and healthy-looking. With doing so your goddess braids will last for several weeks, so you’ll want to wash your hair. But you should avoid doing a daily wash if you’re going to keep the goddess braids tidy and tight. A dry shampoo like Not Your Mother’s Clean Freak will be good to freshen up in between washes. Seabreeze is also a good product to have on hand to help with itchy scalp. Apply the astringent to the scalp with a cotton ball or Q-tip and rub gently to remove dirt and grime from the scalp. You might be wondering what to wear with goddess braids. Goddess braids for weddings are a good idea because they look elegant. In fact, many women make one goddess braid into a halo crown. Goddess braids hairstyles are limited after you have the extensions installed, but a goddess braids updo will look sleek and classy for formal attire. Goddess braids with bangs and the goddess braids mohawk are also a stylish option. Wear your goddess braids in a bun for a professional work style. Maintaining goddess braids is the key to having a long-lasting extension style that looks good. Protective styles are lovely because they protect the ends. The goddess braids style is not as damaging to the roots as individual box braids. You can always monitor how tight you make the goddess braids to avoid stressing your follicles. Be sure to remove them when your natural hair starts to grow, as it can get tangled and intertwined with the synthetic hair. Installing goddess braids is easy once you get the hang of it, and then you’ll be able to do them frequently at home by yourself. Have you tried goddess braids, and if so, how did you like the result?